William Kentridge gives this year's first Norton Lecture in Sanders Theatre on March 20. 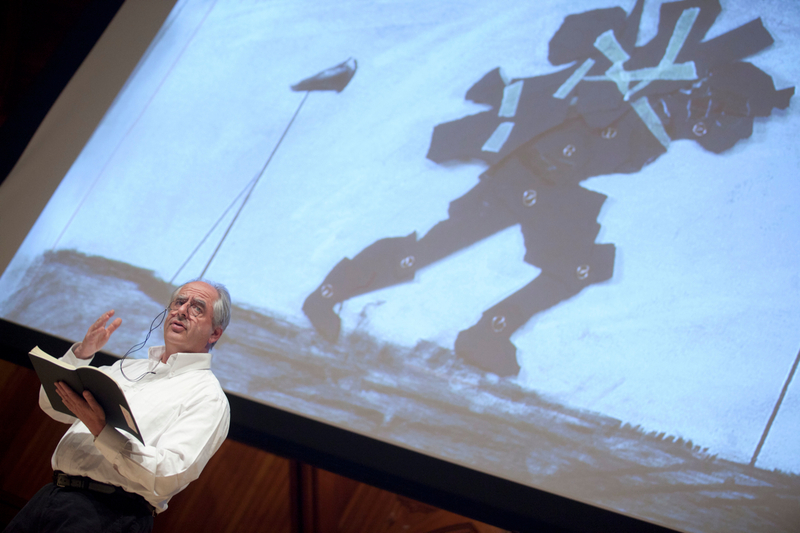 The command “Leap Before You Look” flashes on the screen above William Kentridge’s head, in the middle of a lecture in which he has walked several laps backwards on the stage of Sanders Theatre, attempted to speak in reverse, acted a scene from Waiting For Godot with himself, and transformed a coffeepot into a spaceship in an animated film. His air of breezy nonchalance barely conceals the fact that each lecture is a rigorously choreographed and elaborately rehearsed production. Beckett-like contrivances such as a dialogue between his recorded self and his live, onstage self flower into a seemingly endless garden of ideas about the nature and limits of artistic practice. And with his calculated whimsicality (a product, perhaps, of his brief training as an actor), he embodies what he proposes in his lectures. In Kentridge’s first two Norton Lectures, the South African filmmaker argued that rationality has often served as a mask for power and control, as ideas of what is “rational” privilege one group’s understanding of reality over another’s. In this way, the dedication to rationality that is found Plato’s allegory of the cave unspooled into colonialism and its aftermath. In the wake of such historical violence, art and artistic practice offer an alternative to strict rationality by providing a freer, less hegemonic way of thinking: through means of improvisation, exploration, and spontaneous inspiration. His next lecture, “Practical Epistemology: A Life in the Studio,” continued to plumb the themes of uncertainty and improvisation. Kentridge explored the prehistory of cinema through the work of the early filmmaker George Méliès and technologies like the eidophusikon, stereoscope, zoetrope, and Claude glass. “The early-nineteenth-century invention of photography turned time into stone,” he said. The attempt to come to terms with a medium that immortalized an action that could then be resurrected again and again also opened new forms of play, like reversal or montage. “There is another history of cinema which can be written in terms of technologies of looking,” he explained. What this early history shows, he suggested, is an artistic environment saturated with experimental potential. At this point in the lecture, the phrase “Making A Safe Space For Stupidity” appeared on the presentation screen above his head. It is this idea of safe space that he has committed himself to recapturing. “This necessary stupidity is not the same as foolishness, or the innocence of the pure fool made wise through compassion; it is not the fool’s license to talk truth to power, and it is not simple naïveté elevated, “ he warned. “Rather, it is making a space for uncertainty, for giving an impulse, an object, a material the benefit of the doubt.“ He emphasized that what lies at the heart of “life in the studio“ is the license to make mistakes, take risks, and be wrong in pursuit of creative solutions, even if it involves sometimes starting off on the wrong foot. Kentridge launched into his fifth lecture, “In Praise of Mistranslation,” by claiming that at this point he had used up all of his good ideas in his first four installments. He lectures in a gravely wry tone of voice, delivering his jokes like sermons and his epigrams like punch lines. The result is that one hesitates to laugh until his gags have passed, and by the time that one feels the full weight of his observations, he’s already progressed to the next aperçu. The chameleonic nature of his talks escalated to its zenith here, as he discussed the very process of transformation, and the centrality to artistic work of turning one thing into another (as he demonstrated, moving on from his starting point of claiming to have no good ideas left). Beginning with a looped, zoetrope-like film of a panther pacing in a cage, he turned to Rainer Maria Rilke’s poem “Der Panther.” Kentridge mentioned that he does not understand German, the poem’s original language, and said “every translation is a mistranslation.” He compared this process of deformation, like a game of “Telephone,” to the origins of several pieces of art: Albrecht Dürer’s famous woodcut of an imagined rhinoceros (Dürer had never seen an actual rhinoceros, and had to reconstruct one out of eyewitness accounts and other depictions); Picasso’s sculpture of a she-goat, constructed out of scraps of iron and pottery (representing a kind of translation-in-action by turning what at first seems like junk into a work of art). Kentridge called the act of translation—words into images, junk into sculpture—so fundamental to artistic practice as to be the “bread and butter of the studio”: to create is, by definition, to translate the object one’s work represents. But are there limits on what thinking aloud and discovery by means of reinvention can do? Kentridge turned to this problem by way of valediction in his final lecture, “Anti-Entropy,” by discussing the problem of mythological fate. Every artistic endeavor carries its own internal logic, he observed, as inexorable and limiting as the proclamations of the Greek Fates. As soon as one work is finished, all the other works it could have turned into cease to exist; its initial potential disappears. “The infinite becomes the finite,” he worried aloud, provoking the fear that “with the arrival of the final image” in a film (his chosen medium), “all other images are cut up; all other potentialities close behind us,” in an entropic decay of energy into cool matter. “Can we avoid the end of all potentiality?” he wondered. Spencer Lenfield ’12 is a former Ledecky Fellow at Harvard Magazine. He has just completed his senior thesis on Virginia Woolf’s Mrs. Dalloway.